LITITZ, Lancaster County — Squinty-eyed moles aren’t the only thing Ruth Zimmerman Martin is mindful of when checking a swath of slender purple blossoms in this quaint little town settled byPennsylvania Germans in the 1720s. 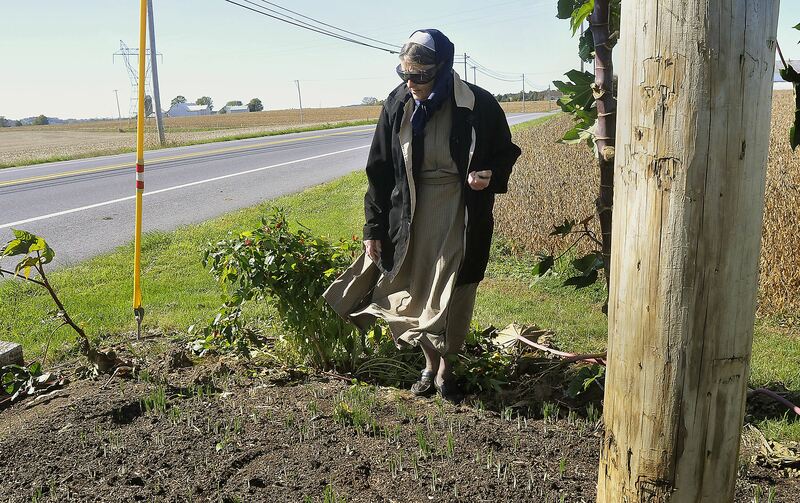 All that separates the 73-year-old Mennonite from traffic whipping past her roadside garden is a few feet of grass and a couple of creosote-stained railroad ties. One false step and — well, she might not ever again see her 18 grandchildren. When you’re growing something as exquisite — and unexpected — as she has for decades, though, the risk just might be worth it. Burrowed into the triangle-shaped bed are 743 Crocus sativuscorms (bulbs) that in the late October sun have sprouted into thin, grass-like leaves interspersed with tiny lilac flowers. Reaching down, Mrs. Martin picks one of the delicate blooms and spreads open the petals. Inside are three bright-red stigma that, when gently plucked and laid on a paper towel in her dining room, will dry into the world’s most expensive spice: Saffron. Famous for giving paella, bouillabaisse, biryani and risottotheir distinct flavor and bright-yellow color, saffron grows best in Mediterranean-type climates with cool, moist winters and dry, hot summers – think Spain, Greece, Italy, India and Iran. So the fact Mrs. Martin will eventually harvest some 5,000 flowers here in Lancaster County, in a handful of gardens and flowerbeds tucked alongside her modest dawdi (retirement) house, could seem an anomaly. But no, she’s got company. A few miles down the road near Millbach, Lebanon County, retired doctor Robert Kline and his daughter Kendra Heck are deep into a saffron harvest, too. For more than a week now, they’ve been picking the dainty flowers from home gardens –backbreaking work that involves gathering the blossoms early in the morning before the sun gets too hot, and using their thumbs to painstakingly separate the red stigmas from the pale-yellow styles to be dried. Each bloom lasts just a few days. Every two to three years the corms have to be unearthed so the smaller ones — Mrs. Martin calls them “itsy-bitsys” — can be weeded out. Though in reality, “you can never have too many,” says Dr. Kline, who started his saffron-growing career 40 years ago with 12 bulbs his mother, Myrl Mann, inherited from her grandmother and passed along before she died. Each saffron corm usually produces between one and three flowers in a season, and the plant quickly proliferates. This year, for the first time in four decades, the Klines’ crop of more than 1,000 saffron plants included a rare albino blossom. Native to southwest Asian and first cultivated in Greece more than 3,000 years ago, saffron has a long and storied history. It got a shout-out in the Old Testament’s Song of Solomon, written in about 1000 B.C., and the pungent spice also decorated Minoan palace frescoes in 1500-1600 B.C. Twenty-five centuries ago, it was used to color the saffron robes worn by Theravada monks and nuns. Around 900 A.D., saffron traveled with Moorish traders into Spain, which quickly became a center for saffron production. By the Age of Discovery, people grew it all over Western Europe. Safferich or safran, as it is known among Pennsylvania Germans, was used by Swiss cooks long before before they made Penns Woods their home more than 200 years ago. Not only did the thread-like filaments infuse food with a deep-yellow color (giving the illusion of lots of eggs) but it also gave those dishes a wonderfully distinct flavor. When they boarded ships bound for their new life in America, they brought the little bulbs with them. The settlers who became known in the late 1600s as the Pennsylvania Dutch weren’t really Dutch, of course, butGerman-speaking Europeans of German and Swiss heritage. Nor were they strictly Amish; in addition to Lutherans, the Anabaptist-related “plain” communities who immigrated here to avoid religious persecution included Mennonites and Brethern, a 300-year-old Christian denomination that stresses peace, justice and holy, simple living. 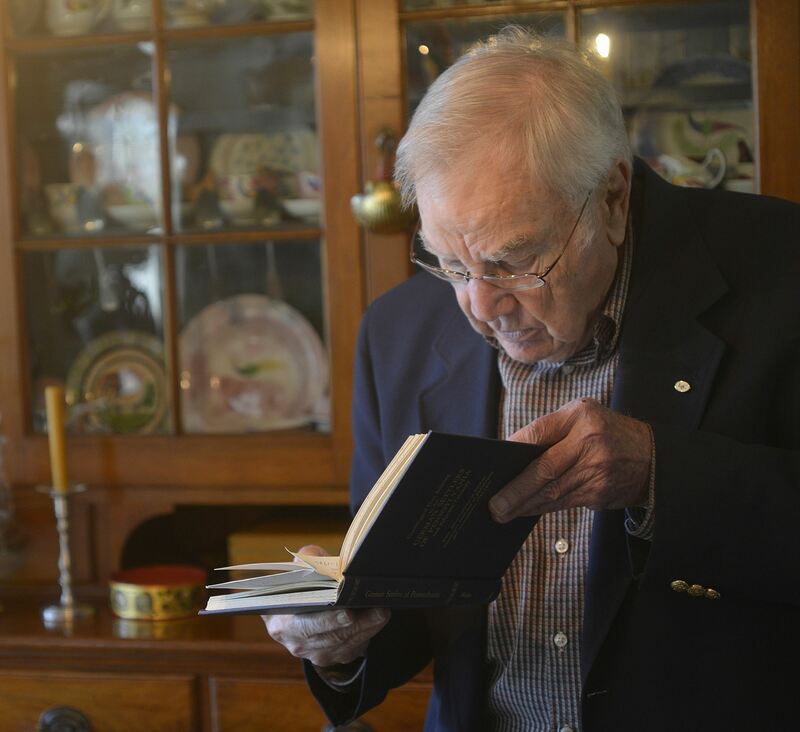 Despite varied backgrounds and an original settlement that fanned out over 30 counties, “the culture quickly developed a common language and common characteristics in its cookery,” writes food historian William Woys Weaver in “Pennsylvania Dutch Country Cooking.” Dumplings and noodles were a common denominator. But a few also hung on to distinctive regional foods and foodways along with their dialects. Among a small group of Pennsylvania Dutch in Lebanon, Lancaster and York counties, saffron was especially popular in flavoring poultry and stuffing dishes. It also ended up in soup,gravy, noodles, chicken potpie and “filling,” a dressed-up version of mashed potatoes. The exotic spice also finds its way into a rich, labor-intensive streuselkuchen known as Schwenkfelder cake. Such was saffron’s popularity that in May 1759, a Jewish peddler by the name of Benjamin Nathanran an ad in Sower’s German-language newspaper advertising the spice for sale along with linens, glass and paint at his general store in Heidelberg, just north of Lancaster. Locals also would have found saffron for sale at Samuel Rex’s store in nearby Shaefferstown. Some cooks loved the tiny crocus so much as to be indiscriminate, notes Diane Wenger, an associate professor of history at Wilkes University in Wilkes-Barre, who has studied saffron use among Pennsylvania Germans. Their tendency to throw saffron into all manner of dishes earned them them a derisive nickname — Geeldeitsch, or Yellow Dutch. It was German Jews in Pennsylvania, in fact, who took control of the Caribbean saffron trade from Spain and England in the 1790s, notes Dr. Kline, whose expertise on Pennsylvania Dutch culture and heritage extends to open-hearth cooking, baking and gardening. Pennsylvania wasn’t the most hospitable climate for saffron-growing, but Pennsylvania Germans proved to have something of a green thumb for coaxing the fast-spreading crocuses to life each fall. So much so, that in the years leading up to the Revolutionary War, the spice was a commodity on the Philadelphia exchange, with prices equal to those of gold. Even today, it can retail for as much as $10,000 a pound. By the 20th century, though, saffron was no longer being grown on a large scale in Pennsylvania, and was instead relegated to the kitchen gardens of those whose parents and grandparents had loved it. Today, as in the rest of the country, most of the spice sold in and around Lancaster is imported from Spain or Iran. By growing and cooking with it — corn soup and stuffing are his favorites — and getting his children to do it also, he’s keeping that age-old tradition within Pennsylvania’s narrow “saffron belt” alive. Mrs. Martin, conversely, became a devoted grower quite by chance. Though she was familiar enough with the spice — it’s what gives Pennsylvania Dutch noodles and chicken potpie their unique flavor and yellow color — it never crossed the mother of seven’s mind to grow it. Then 30 years ago, after moving some furniture for a neighbor, her late husband, Lloyd, was gifted 20 saffron bulbs. On a whim, she planted them in front of their dairy barn. The first year, the plants were beautiful. The second, not so much. “Too squishy,” she recalls with a shake of the head. So much so, that some days during the late-fall harvest, upwards of 1,000 flowers end up in the squat wicker basket she keeps just for this purpose. It takes her about 25 minutes to pick them. She’s also figured a way to deal with those pesky moles who find the corms so delicious. She plants hot chili peppers on the edges of her gardens, along with castor-bean plants and winter onions. Bunnies, who love to chew the grassy crocus leaves to the nub, have to constantly be shooed away. “If a rabbit finds it, he never forgets it,” she says, sighing. She advises would-be growers to mulch with manure instead of bark and keep the soil around the crocus corms loose and aerated. Also, don’t disturb the bright-green winter growth. “It’s very good for the pancreas,” says Mrs. Martin, which is why she often tucks tiny packets into greeting cards and gifts them to shut-ins. She also sells some of the excess for $3 a packet at Forgotten Seasons, her daughter Kathy’s bed-and-breakfast in Lititz. “It’s a wonderful hobby,” she says. A bit on the tangy side. You can find dried limes (which sort of look like walnuts) at Pita Land in Brookline. Heat oil in stockpot over medium heat and cook onions for about 10 minutes, until they start to brown. Add turmeric and corn. Pierce the limes with knife or fork and add to the pot along with their soaking water. Add stock and bring to a boil. Cover and simmer for 15 minutes, until corn is just tender. Squeeze the limes against the side of pot with a long spoon to extract their concentrated flavor before removing them from the soup. Blend half of the soup in a blender, then return to the pot. Add saffron and season to taste with salt and pepper. Add lemon juice to taste, and serve. The contrast of sweet onions and briny olives are actually quite harmonious in this simple, skillet chicken dish. In small bowl, mix together the salt and cayenne and season chicken pieces with mixture. In large cast-iron skillet, heat oil until smoking. Brown chicken pieces, cooking them for 6 to 8 minutes on each side. Transfer chicken to a plate as it is cooked. Add flour, saffron and onions to skillet. Add any remaining salt and cayenne mixture. Cook, stirring continuously, to wilt and brown the onions, scraping the bottom of the pan to loosen any browned particles, about 10 minutes. Add chicken pieces and olives. Continue stirring, again scraping the bottom of pot to loosen any browned particles, and cook for about 15 minutes. Add chicken stock, cover and reduce heat to medium. Cook, stirring occasionally, for about 15 minutes, or until chicken is tender. Place on a swanky platter and sprinkle with chopped cilantro, pomegranate seeds and scallions, if using. A beautiful and savory side dish. Perfect with baked or grilled chicken. Preheat oven to 375 degrees. In a large ovenproof saucepan, melt butter. Add onion, bay leaf and a generous pinch of salt and cook over moderate heat, stirring occasionally, until softened but not browned, 5 to 7 minutes. Add lemon juice, coriander and saffron and cook until fragrant, about 1 minute. Add rice and cook, stirring until translucent, about 3 minutes. Add wine and simmer over moderately high heat until nearly absorbed, about 3 minutes. Stir in stock and a generous pinch of salt and bring to a boil. Cover the saucepan and bake the rice for 20 minutes, until all the liquid is absorbed and rice is tender. Let stand for 15 minutes, fluff with fork and serve. Paella is traditionally made with rice. This version combines spaghetti with chicken and seafood. My dad loved it. In 5-quart saucepan or Dutch oven, heat oil over medium-high heat. Add chicken and season with 1/4 teaspoon salt and 1/4 teaspoon black pepper. Cook until chicken is no longer pink on outside, 3 to 4 minutes. Using a slotted spoon, transfer chicken to medium bowl. Add fennel, bell pepper, onion and garlic to pan. Season with 1/4 teaspoon salt and 1/4 teaspoon pepper. Cook until just tender, about 5 minutes. Add clam juice, tomatoes with their juices, bay leaves, paprika, saffron and cayenne pepper. Bring mixture to a simmer. Add spaghetti and cook, stirring occasionally, until almost tender, about 9 minutes. Return chicken to pan. Bring sauce to a simmer. Add remaining salt and pepper. Add clams and shrimp. Cover and cook until clams open, the shrimp are pink and cooked through and the chicken is cooked through, 4 to 5 minutes. Discard any unopened clams along with bay leaves. Mix in parsley and serve. This hearty noodle stew is a Pennsylvania Dutch classic. It more reminiscent of chicken and biscuits than the pastry-topped pies made famous by Swanson. If you’re afraid to make homemade noodles, don’t be — they’re easy! But you also can substitute flat pot pie egg noodles. 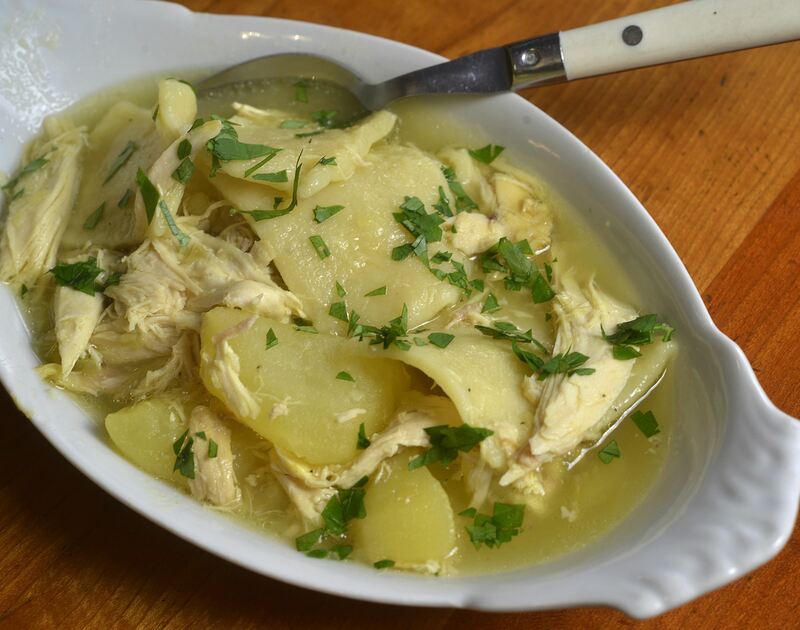 Cook chicken in 3 quarts water with salt, pepper, saffron and celery for several hours, until it is tender. Remove chicken, debone it and set aside to cool. Add potatoes and onions to broth, and cook for 15 minutes, until fork-tender. While potatoes are cooking, make potpie noodles. Combine dry ingredients. Cut the lard into the flour mixture until the pieces are very fine. Lightly stir in the beaten egg and water. Roll out very thin on a floured board. Cut into 2-inch squares with knife or pastry wheel. Don’t aim for perfection! Shred chicken, or cut into large chunks. Drop potpie squares one by one into boiling broth with potatoes. Reduce heat, and cook over a low boil for about 5 to 6 minutes. Add chicken, and season to taste with salt and pepper. Serve in individual bowls, spinkled with chopped parsley. If you make individual servings of biryani in smaller ovenproof dishes, slightly lessen the cooking time. Note: the more chiles you use, the spicier the dish. Mine was red hot. In small mixing bowl, combine warmed milk and saffron strands and set aside to soak for at least 30 minutes while you prep the remaining ingredients. In bowl of food processor, grind ginger, garlic, fresh chiles, cilantro and mint leaves into smooth paste. Transfer to large mixing bowl. Add garam masala, red chile powder, turmeric and yogurt and stir until well combined. Slowly fold lamb into yogurt mixture and stir gently until all pieces are evenly coated. Cover and refrigerate for 2 hours or overnight. In heavy-bottomed, 4-quart saute pan over medium-high heat, warm 1/4 cup of the oil. Add onions and 3 pinches salt. Cook, stirring occasionally, for 15 minutes, until onions are browned. Using slotted spoon, transfer onions to a plate and leave oil behind in saute pan. Raise heat to medium-high and warm remaining 2 tablespoon of oil. Using tongs, carefully add marinated lamb to saute pan, leaving marinade behind in bowl. Reserve it — you’ll use it later. Cook for 2 minutes on each side. Reduce heat to low and add reserved marinade and all but 2 tablespoons onions to saute pan. Sprinkle with remaining 1/2 teaspoon salt. Cook, partially covered and stirring occasionally, for 30 minutes. Remove from heat and set aside. Set oven rack at second-from-top position and preheat oven to 450 degrees. In separate medium stockpot over medium-high heat, combine rice, raisins and water to cover rice by 2 inches and bring to boil. Reduce heat to medium and cook, uncovered, for 7 minutes. If using brown rice, cook for 12 minutes. Remove from heat, cover and set aside. Transfer lamb mixture to a 2-quart ovenproof casserole dish and layer rice over lamb. Tightly pack rice in dish and garnish with reserved browned onions. Pour bowl of saffron and milk over the casserole. Cover dish with its lid or tightly with aluminum foil. Bake for 40 minutes. Remove from oven. Serve immediately. This vegan bread dough is soft and easy to manipulate, ”so you can give it any shape you like,“ Aglaia Kremezi writes in ”Mediterranean Vegetarian Feasts.“ It was inspired by a traditional wedding bread from Greece. In bowl of a stand mixer fitted with dough hook, combine flours, yeast, salt and mahlep; pulse to blend and aerate. In blender, combine saffron water, tangerine, orange juice, sugar, almond butter and olive oil. Pulse, periodically scraping down the sides with a spatula, to get a smooth pulp. With motor of mixer running, pour wet mixture into dry ingredients and work mixture on low speed for a couple of minutes, adding about 1 1/2 cups water or as needed to form a dough. work dough for about 5 minutes on medium-low to make a soft dough that “cleans” the sides of the bowl. Oil a large bowl and piece of plastic warp. Turn out dough onto your work surface and shape it into a ball. Transfer the dough to the oiled bowl and cover with the oiled plastic wrap. Let rise until doubled in size, about 1 1/2 hours. Turn out dough and halve it, using one piece to make the stuffed bread. If you like, shape both pieces of dough to fit pans lined with parchment paper. Cover loosely with plastic warp and let rise again for 35 to 40 minutes, until almost doubled in size. If you like, dilute the sugar in the orange juice and brush the tops of breads with the mixture just before putting them in the oven. Bake for 10 minutes, reduce heat to 375 degrees, and continue baking for 20 minutes (or more, depending on size of pan), until golden brown in color and hollow sounding when tapped on the bottom. You may need to turn and change the position of the loaves halfway through baking to make sure they color evenly. Let cool completely on wire rack before cutting to serve. An elegant, absolutely beautiful dessert. Put vanilla bean, saffron threads, sugar, lemon zest and 2 cups water in a large saucepan and mix together well. Stir over low heat until sugar has dissolved. Bring to a boil over high heat, then reduce to a gentle simmer. Add pears and cook, covered, for 12 to 15 minutes, or until tender when tested with a metal skewer. Turn pears over with a slotted spoon halfway through cooking. Once cooked, remove from syrup with a slotted spoon and set aside. Cover to keep warm. Allow the saffron syrup to come to a boil and cook uncovered for 8 to 10 minutes, or until syrup had reduced by half and thickened slightly (mine took about 15 minutes). Serve pears with the sauce spooned over and some whipped cream on the side, if desired. In small saucer, steep saffron in water. Set aside. Cream butter. Add sugar, beating well. Add egg, beat until thoroughly blended. Sift dry ingredients. Stir into creamed mixture. Add saffron water. Chill until firm enough to handle. Roll into balls, flatten with fork. Bake in a preheated 400-degree oven for 7 to 10 minutes. Thanks to America’s changing demographics, consumption ofspices in the U.S. is way up in recent years. That includes saffron, which is used in Asianand Mediterranean cookingalong with Indian and European cuisine. “There are a lot of educated chefs in American kitchens” who appreciate its woody aroma, distinctive hay-like flavor and superb coloring, says Aziz Osmani, co-owner of Kalustyan’s, an international food market in New York City. It turns foods a luminous yellow-orange color. Often added to rice dishes, saffron can also be used inbaked goods, curries, meatdishes, soups and confections. Spanish saffron may be the best known saffron, but the highest-quality spice, according to Mr. Osmani, actually comes fromKashmir and Iran, where 90 percent of the world’s saffron is produced. It’s more expensive, but it’s also a deeper red, since every bit of the yellow styles is removed, which gives it a more intense flavor. “So it’s actually cheaper in the long run, because you use much less,” he says. Lower-grade saffron has more of the flavorless yellow style in it. When buying, look for evenly colored, vivid red or deep orange threads. Names to look for are coupe, superior, La Mancha, or Rio. If you can taste the saffron in a dish, you’ve added too much. A good rule of thumb is to use about three strands a person. A small “pinch” is about 20 medium saffron threads; a medium pinch has about 35, while a large pinch is about 50. The spice should be dry and brittle to the touch and never smell musty. Whatever the country of origin, a little saffron usually goes a long way; most recipes only call for a pinch or less. Stored properly in an airtight container away from heat, light and humidity, it will last for years. Expect to pay anywhere from around $4 for a .4 grams of Badia Spanish saffron at Giant Eagle, to $7.99 for a 1-gram packet of Krokas Kozanis Greek saffron at PennsylvaniaMacaroni Co., to $142 for a 1/4-ounce jar of Saffron Kashmir at Penzeys. You also sometimes can find it pretty cheap at discount stores such as Marshall’s. Spice giant McCormick also sells saffron in larger grocery stores. You can buy saffron in powdered form, but buyer beware: Not only does it lose its flavor more easily than threads, it can easily be adulterated or misrepresented with lesser-quality spices such as turmeric,paprika and marigold leaves. To heighten the color and flavor of saffron filaments, steep crushed strands in a little hot water. Add strands and water to recipe. You also can toast it in a small skillet over medium heat for about a minute, then crumble it into the dish with your fingers.